The menu says it all: sticky, spiced, chilli, pickled, hellfire, toasted, lime, relish, barbecue, jungle, death, caramelised, charred. The words are emphatic, the din is relentless, the energy is high. Chin Chin is up front, up to date and up here. 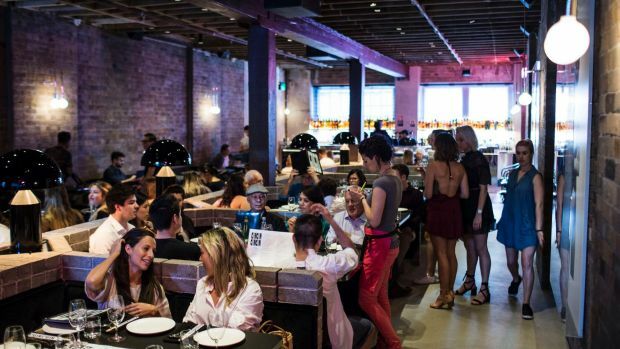 In a strange way, this new-to-Sydney Melbourne transplant is as much Greek as it is Thai. Chief executive of the Lucas Group, Chris Lucas, general manager John Kanis and interior architect of the moment George Livissianis all have Greek heritage, which gives a no-nonsense, cut-to-the-chase, get-it-done-now attitude to proceedings. It must be a Melbourne thing: there is nothing like it in Sydney. There’s nothing quite like the building it’s in, either. The 100-year-old, heritage-listed, wedge-shaped Griffiths Teas building lay empty for some 30 years. Now, the joint is jumping. The vast room eats up the people, flooded with natural light by day, and relentlessly loud at night. Next door is GoGo, a dark, sultry diner that’s all concrete and velvet, and below is a funky events space called Chii Town that opens to Wentworth Avenue. Chin Chin group exec chef Benjamin Cooper is up from Melbourne to bed it in with former Spice Temple chef Graeme Hunt. 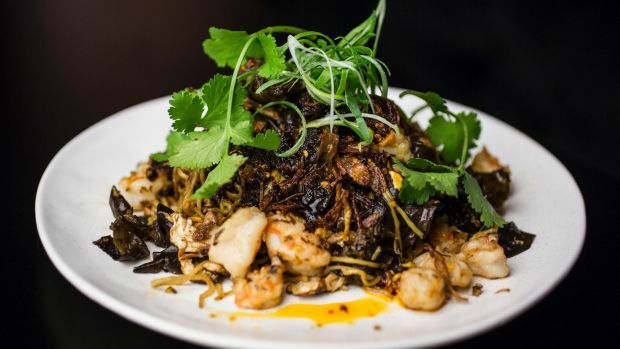 They’re busting out everything from Massaman braised brisket curry and squid and green mango salad, to beef rendang, kingfish sashimi and spicy Isaan barbecue chicken from a bespoke charcoal pit and giant rotisserie. Some’s blah, and some’s rah; that’s how they roll. Big, dark balls of corn and coriander cakes ($19.50) are spongy and bland, and a barbecue ocean trout salad ($22.50) is unremarkable, with muddy-tasting fish. 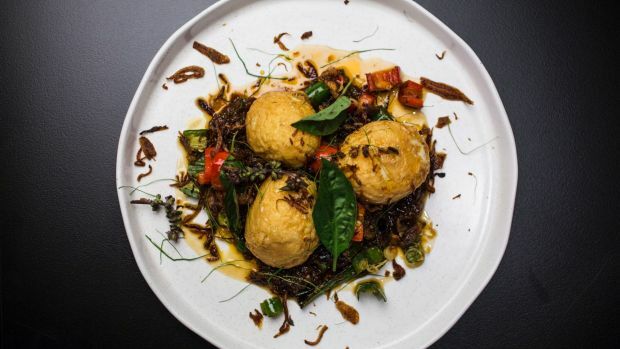 Sticky tamarind chilli duck ($17.50) is bloody rich, but somehow the genius addition of deep-fried, soft-yolked son-in-law eggs turns it into something textural, new and balanced. Little nuggets of spiced and fried black pudding ($17.50) come with a crab head nam prik relish – another successful innovation. Duck livers ($22.50) are grilled and sliced, rare-hearted, into a searingly, painfully hot and sour herb salad under a dusting of ground rice. 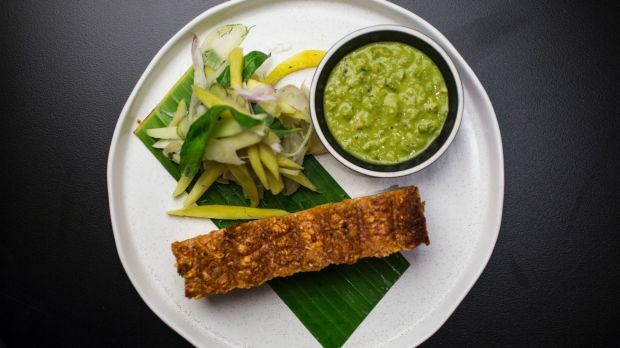 The most notable dish for me is a green curry of brined and grilled kingfish wings ($19.50). It’s messy getting the flesh off the bone, but it’s so white and sweet, and the sauce is so light, green and fresh, popping with pea eggplants and crisp baby corn, that it’s a real treat. Roti ($5.50) or rice ($3.50) is definitely required. The cocktail list is so oblique as to be bordering on the silly, but the wine list is great, with every wine-maker listed, and a fab range of on-tap wines. It’s hard to beat a fresh, zesty 2017 Jumping Creek Bon Blanc or a fragrant, silky Yabby Lake pinot from Tom Carson at $11 a glass, $28 a carafe, and $49 a bottle. Chin Chin is undeniably magnetic; its own high-energy giving it constant momentum. You will be asked multiple times if you want a cocktail, beer, or second bottle of wine – although actual delivery on the booze side can be slow. It’s a machine designed for eating and drinking that is almost aggressively geared to turnover, successfully disguised as a raucous, good-natured party. At the end of the night, you leave it as you leave a party – a bit dazed, ears ringing, energised, exhausted, and feeling good. Worst bit: It’s bloody loud.